JNTUK B.tech/B.pharmacy 2-1 (R13,R10,R07) Supply Exam Fee Notification 2017. Jntu kakinada announced the 2-1 supply Notification for R13,R10,R07 Regulation students. Those who are failed in their regular examination they can write these examinations. 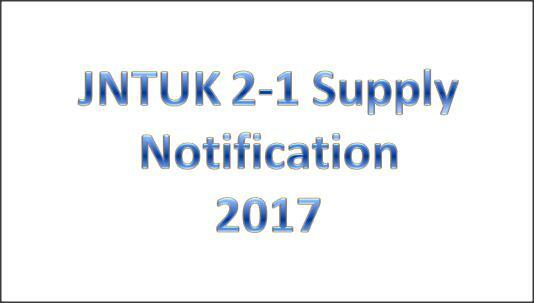 In the following we provide the complete details of JNTUK 2-1 Supply Notification 2017. In this Notification we provide the Exam fee details and exam registration last dates. For more details of this Notification open the above links.